In today’s world, most of us are not defending one-dimensional Quarterbacks. We see dual-threat athletes under center (or not under center, anymore!) week in and week out. Sprint Out Passing is one way that Offensive Coordinators are using these dual-threat Quarterbacks to move the football down the field. In this short video, we’re looking at how to stop the Sprint Out Passing attack from a Twins Formation using your base 4-2-5 Defense. The same principles can be applied to any defense, of course. The Quarter-Quarter-Half coverage concept we’re using works seamlessly with the 3-3-5 Defense, 4-3 Defense, 3-4 Defense or any other front. For the transcript of this video, scroll down below the video player. We’re looking at defending the Sprint Out Pass to the Twins side. In sprint out passing the Quarterback is going to be trying to break contain. You’re probably going to be dealing with a 2 man route concept, like a Smash Concept. For coverage, I like a Quarter-Quarter-Half coverage or we can use a man coverage. We’ll use Quarter-Quarter-Half here in our 4-2-5 Defense. We’ll have the weak safety on the Tight End side, and a corner over top of the Tight End. The Corner and the Free Safety are playing deep half. The corner is 7×2 inside leverage on the #1 Receiver. The Strong Safety is 5 yards off, 1 yard outside of the #2 receiver. We align our front different from our back end. The strength of the front is to the Tight End side, so we are in good shape to stop the run. Now we have to stop the Sprint Out action. The Defensive End has to work to defeat a reach block. The R and H Backs will try to seal the edge. We are not concerned with the back side Tight End’s route, but he will probably run a deep post route. Even if our Defensive End does a good job of fighting the reach block (which is the most important part of defending the Sprint Out), we have to contend with the block of the R and H Back. We want to take away 3 things against sprint out: 1) The deep route, 2) The intermediate route and 3) an easy run for the Quarterback. The deep quarter defenders have the deep route covered. What we don’t want our flat defender to do, is to jump the Quarterback’s sprint out action and give up an easy completion on the intermediate route. We need to have a plan for defending all 3 parts of the play. 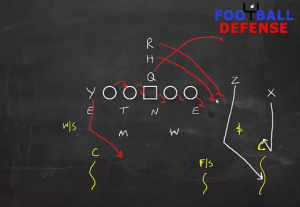 The Corner makes a “China” call to the Strong Safety, who sprints out to handle the hitch route. Our underneath defenders take their Cover 3 drops, but when the sprint side Linebacker sees the QB break contain, he comes up to attack the Quarterback. The back side Inside Linebacker needs to rotate over to replace the hook zone that was vacated by the sprint side Linebacker. With the flats and the hook covered, the Weak Safety has no reason to stay on the back side and works his way to the middle. He will help to be underneath back side routes by the Tight End. The Quarterback is now bottled up and must either run for a short gain (or loss), throw the ball away, or make a dangerous throw into coverage. With our plan in place, we can now defend the Sprint Out passing game with our base 4-2-5 Defense.